There is no one size fits all solution for the Balanced Scorecard automation. Some companies create basic KPIs in Excel and report their scorecards via PowerPoint; some buy complex performance management software. Every business chooses the tool for their needs, learn why people use BSC Designer, and how they use it to automate their business scorecards. I have been trying to figure out how to automate scorecards. I learned about this product and decided to use and implement this software for trial. It gave brilliant results and I would opt for the professional edition in the future. I suggest managers to use BSC Designer software – it will optimize your time and perform good results. Mark, thank you for your note. Surprisingly, but our main competitor in scorecard automation are spreadsheets. Unfortunately, spreadsheets are not suitable for scorecard design, especially when the project grows. BSC Designer allows automation of scorecards focusing not only on KPIs (which is in most cases an obvious task), but on strategy maps, business objectives, and dashboards. A recent survey showed that the business scorecard project automated with a spreadsheet as being more likely to fail, while scorecard projects supported by a professional business performance software helps businesses to perform better. 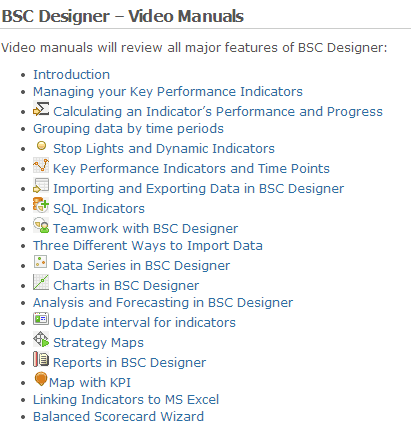 For those who are limited in a budget and are starting with their business scorecard project I suggest starting with a freeware edition of BSC Designer – BSC Designer Light. In this tool you’ll find all of the basic functions one need to manage with KPIs. Once a project grows, one can update software to PRO. The Balanced Scorecard project file will be the same. The difference is that in the interface of the software one will find more functions. 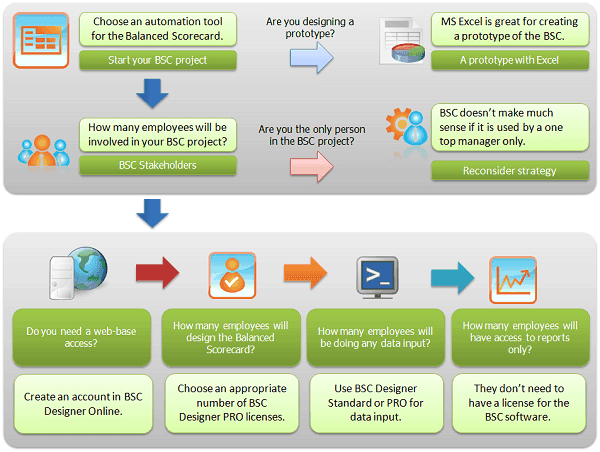 In BSC Designer any type of a business scorecard can be automated. 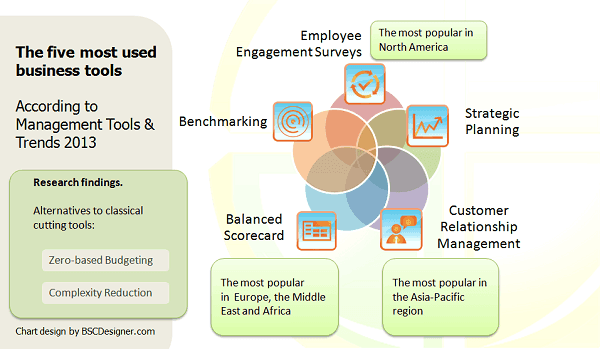 And for sure, the most popular one is the Balanced Scorecard. Other users reported that using this framework one can actually translate top level vision to employees. We are looking for the ways to improve the BSC Designer product even more. If you tried building scorecards with BSC Designer, feel free to share your thoughts in the comments. What reports, chart, automation feature, or importing function do you need? Check the full text in “Strategic Planning: The Quest for a Balanced Scorecard“. It was really interesting to read about the application choice process used in this university. We are glad that the final choice was BSC Designer. I’d like to discuss some details that other visitors of our website would benefit from. One of the key parts of strategy execution best practices involves company employees in the process. We believe that it is not possible without automation software. And what is more important, the automation software must speak your language. That’s why BSC Designer is localized to the most popular European languages, as well as to Arabic and Chinese. We did the localization with the help of Alconost, who are professionals in software localization. The most challenging task was the translation of specific strategy management terms. I believe that the localization was a success, as among users of BSC Designer are business professionals from all over the world. As for the cost, we are trying to be flexible here as well. There is a BSC Designer Light, as a free edition that can help to start with KPI/BSC projects. We know that it is primary used for prototyping and teaching purposes. Once the company decides to take the next step in the BSC process, it can follow one of the suggested implementation plans and choose the correct number of PRO licenses. Finally, if company decides to use BSC Designer Online, then it is possible to enjoy the software as a service model, paying just a monthly fee without any additional maintenance costs. As for training, we follow this principle: if a customer asks a question then we will answer it in detail. If another customer asks a similar question, then we need to create a good video and text instruction that will answer the question. As a result, all major functions of BSC Designer video manuals are available. Also, our experts can help with some theoretical questions of the Balanced Scorecard, and the best idea to find the correct information is to check our articles library. We are hoping to create a business environment for our company that is well controlled, easy to manage and fun to operate. (c) Add-ons such as dashboards etc. are visually appealing, impact-full, and relevant. The training guides, various links, tutorials and so on are useful and assist in the overall understanding of the product. The marketing of the product is good and access to your various websites is easy. Purchasing of the product is relatively hassle free, efficient and non-threatening. We were pleasantly surprised by the quick response time following our purchase and will not hesitate to recommend your product to other interested parties. We are still at the early implementation stage and will be in a better position to comment further on your product when we have had more experience in its use. Thank you for your feedback. With the Balanced Scorecard the software needs to be followed by a detailed training course, if not, users fail to understand this complex concept. That’s why we provide various articles on the topic and training guides. One of the goals of the software is to show end-users a big picture of what’s happening in the business. That’s why with every release we are trying to make it even more visually appealing and provide users with more information about the Balanced Scorecard project. Lately, we have improved dashboards and strategy map functionality. It is important for anyone who use the Balanced Scorecard and various KPIs to understand the difference between performance monitoring and progress tracking. For sure, the software supports both approaches. We do recommend you to try the latest version of BSC Designer and hope you obtain great results with the Balanced Scorecard concept. In the first step, I used BSC Designer to handle some strategic data in my IT-Department (money, user, availability, development). When I’m more firm using the tool, I would like to introduce it to our financial department for their needs. Being new to BSC, I was surprised by the easy handling of BSC Designer. Even for a newbie like me, it helped me to understand rapidly, not only how the product works, but to apply the concept of the BSC. For until now, I have mostly “played” with the program enough to derive what advantages it will give to me, and for the moment I’m more than satisfied with the feedback I get from the program. I’m rather sure that BSC Designer will even become a daily tool for me. With BSC Designer it is easy to start a project. Although there are many functions in BSC Designer that support various sides of the performance management (KPIs, Dashboards, Strategy Maps, Alerts, etc. ), a user doesn’t need to start using everything right away. We know users that find the KPIs tab especially useful and focus their daily activity on this tab. Others prefer to work with the strategy map, and they create several maps; some of them are detailed process maps, and others are general strategic maps. As a developer we understand that there are various ways to achieve the same business objective. That’s why we provide necessary performance management tools. The choice of the specific tool depends on your current business needs. I believe that one of the most important applications of BSC Designer is using it to see the big picture. There are a lot of operational tools in your business that already provide a huge number of measures, but it is important to focus on what really matters. For example, in Google Analytics there are a lot of metrics. One can use “monthly visitors count.” From the first look it sounds relevant, but actually this metric makes more sense if you can see the change of the monthly visitors in dynamics so that you can have an idea about whether or not your website visitors are growing or not. Another important application that is often overlooked is an alignment of KPIs with business objectives and action plans. That’s what makes BSC Designer a tool that you will use every day. Don’t think about it as a project management software, but as a control center that you use to effectively manage operational goals and plan future improvements. We use the Balanced Scorecard concept in our marketing project. Particularly, it includes KPIs for supply accountability, and KPIs for hygiene accountability. Our current business objective is formulated as increase lines of business to increase production. I have used the Balanced Scorecard concept without software and there is a lot of material to keep track of. The software makes it easier to keep it all in one place and organized. I just need to know more about what the software can do and how it works. I am just not that familiar with it yet. Hello, Kent. 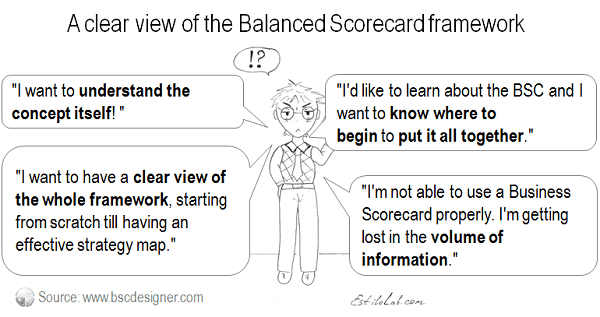 You are right, Balanced Scorecard software (for example our BSC Designer) helps to manage things so that you can finally focus on what matters (design of the strategy, guiding policies, KPIs, dashboards, visual maps, action plans) instead of spending time on organizing things. BSC Designer has a lot of features that one needs, so I suggest you use the following plan to explore all features of BSC Designer. Start with Samples. In the installation directory of BSC Designer you will find a folder called “Samples.” There you will find some sample BSC projects to review. Once the project is opened check out KPIs, Business Goals and Strategy Map tabs in BSC Designer. Create your objectives. Follow some examples and try creating your own projects. Don’t start with KPIs, start with business objectives. Go to the “Business Goals” tab and make sure you have several top-level business objectives which contain more detailed objectives. When you switch to a strategy map, BSC Designer will build up a map automatically. When you will manage it with a program, you could crate everything you need right on the strategy map. Here is a detailed guide about creation of strategic maps. Add your action plan. Now after you have answered the “Why?” question of the strategy, it is time to add more details into the “How?” part. With each business goal you can associate an initiative that one can follow. KPIs! Now you know what you need to do and why you need to do this (don’t forget to link business objectives with each other showing their cause-and-effect connections). The question is how do you know that you are on the right track? It is time to add KPIs. You don’t add KPIs from lists taken from the Internet, as they are pointless if they are not connected to your strategy. 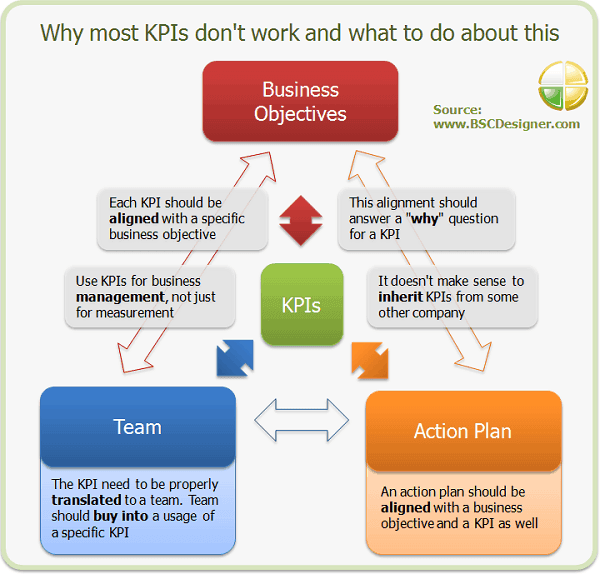 You need to come up with KPIs that are relevant to your business objectives and action plan. Read more about good KPI design in this article. I was looking for a user-friendly BSC software to be able to support my assignment to implement the BSC concept for my clients. After trying to use BSC Designer, I found out that it’s truly an amazing and useful tool. I’m going to introduce your software to my clients, as well as showing your website to them for learning the more advanced BSC program. Thank you for the introduction of BSC Designer to your clients. One of the benefits of BSC Designer is that it is really easy to install. It doesn’t require neither any complicated installation process, nor installation of a database. For sure, there is an excellent functionality as well that will support all your business scorecards. Another important thing is that the program uses open XML-base format. For an end user it means that it is easy to manage .BSC project files. Do with .BSC document whatever you would do with a Word document or Excel spreadsheet. You can send it to your colleague or check in to the version control system to ensure multi-user access. On our website information about the Balanced Scorecard is located in Articles section. You can direct your customers there. 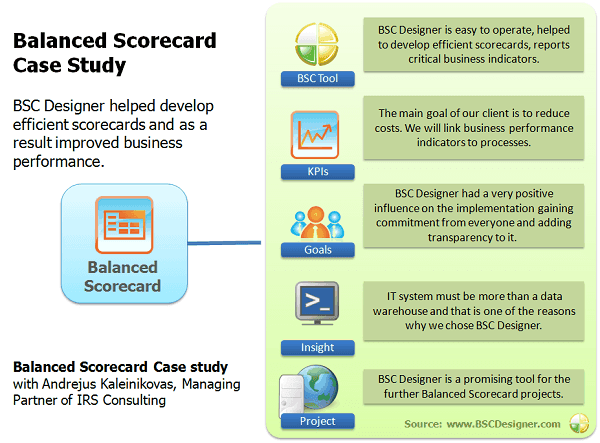 Also, some users reported that BSC Designer itself helped them to understand the Balanced Scorecard concept better. In your case it might be easier to teach your clients by showing appropriate examples directly in the software. Talking about an implementation of the Balanced Scorecard concept, we are often asked for a detailed implementation plan. I’m sure your clients will also ask you for something like this. From this diagram you can learn what roles appears in an organization once the Balanced Scorecard is implemented. Click on the diagram to learn more about a suggested implementation plan. Finally, consider joining our partner program, which is available for BSC Designer desktop editions, as well as for the web-based BSC Designer. I work as a consultant, applying BSC concepts, your tool would be a very welcome addition supporting my efforts. I have not applied yet at any of my clients’ environment. However trying it while using sample data demonstrated to me that it can greatly assist in applying the BSC concepts and providing the management with a simple and easy to read dashboards and charts summarizing the status of their initiatives. Thank you for sharing your feedback. When you have more clients interested in implementing BSC Designer in their business environment, consider our partner program. 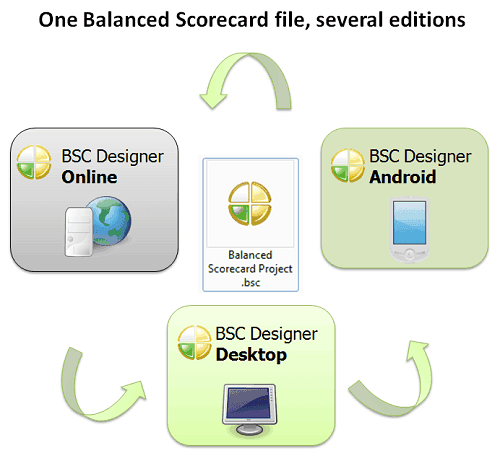 You can join it to resell desktop and/or web-based editions of BSC Designer. Also, consider upgrading to PRO edition, it will give your customers much more compared to the Online. 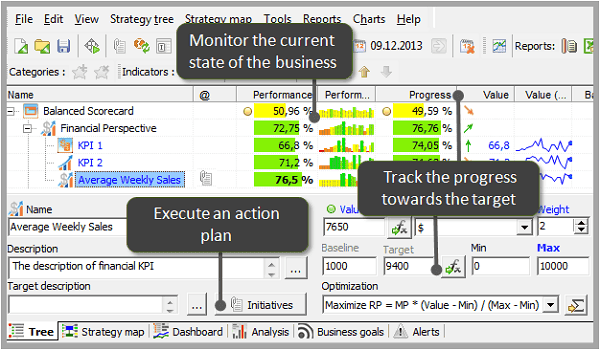 In the PRO edition you have access to strategy maps and can use them to build more sophisticated dashboards and maps where the cause-and-effect connection between business objectives will be visualized. I will be using BCS Designer within my team to build the Balanced Scorecard for the measurement of the performance of some of our programs. The product allows relating measurements to our corporate goals. I’m going to use BSC Designer for the self-evaluation based on my own life goals as well. Only recently I’ve started to use your solution and every time I use it, I learn something new about the program. Getting additional training has been critical to get the value out of BSC Designer PRO. Also, I was considering if I needed to get some training on Balanced Scorecard or not, but after purchasing some eTraining material I can say that it has been beneficial to increase my productivity on the use of Balanced Scorecard and BSC Designer PRO. The BSC Toolkit is also a product that needs to be considered. BSC Designer needs to be considered by any organisations that is looking for adopting balanced scorecards. It will help to accelerate the implementation of the balanced scorecard methodology in your environment. Thank you a lot for sharing your opinion. We are happy that you found our eTraining and BSC Designer products useful. Doubtless, BSC Designer helps to implement the Balanced Scorecard faster and invest less efforts in maintaining the scorecard. We know that most companies start their first scorecard in Excel, but this normally leads to the difficulties associated with the update of the scorecard. Moreover, BSC Designer is not only the tool that helps with measurement. It helps not only with KPIs, but with description of the strategy. A well described strategy is an excellent tool to improve business performance. 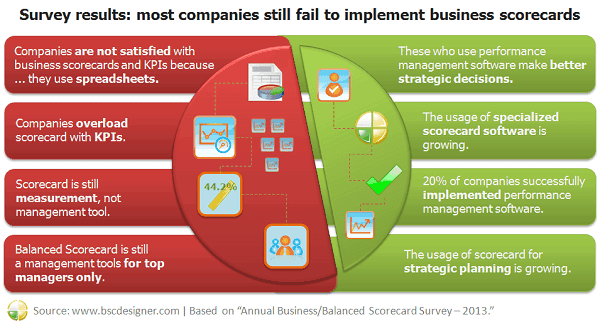 And the Balanced Scorecard is primary about the strategy, not just about KPIs. Recently we discussed this in details. Finally, I must say that it is an excellent idea to use the BSC Designer to track your personal goals. In this way you will learn the product much better and will be able to translate your knowledge to the others in your company. This might be very challenging as well. We have an article were we discussed the possible problems in this regard and solutions to them. I was looking for a software for strategical planning for the company where I work, therefore we are looking for a way to implement the Balanced Scorecard. I found the BSC Designer, which is a very practical software with excellent functionality. I am still testing some functions, but I can already confirm that it is going to adjust itself perfectly to what I am looking for. Fernando, we are glad that BSC Designer is what you are actually looking more. We have a lot of clients from Latin America. With BSC Designer we provide not only an excellent functionality, but an interface localized in local languages. According to recent research Balanced Scorecard is one of the most used business tools in Latin America. Taking about strategical planning, I do recommend for you to download and try the latest version of BSC Designer. We have improved a lot the strategy design process. The key part of any strategy is a strategic map. In BSC Designer you can place on a strategy map your business objectives and then align them with each other and with KPIs. Here we describe how the process works step-by-step. There are many other customers who use BSC Designer to define a business strategy or communicate it to employees. In BSC Designer we are implementing the best practice experience that can help a company that is just starting to come up with a good strategy. Also, there is one popular article on the topic that I’d like to recommend you: Vision and Goals vs. Strategy Map and Objectives. It explains some key ideas about vision, mission, business goals and objectives and puts these terms into their places. Finally, strategic planning is just the beginning. Once you have a strategy (even the best one), you need to execute it properly. That’s where the BSC Designer software will be really helpful. First, it allows to align KPIs and objectives with action plans. Second, it provides means that an executive can use to communicate the strategy to employees and other stake holders. Give it a try and feel free to contact us if you have any questions. Working in education area I plan to apply BSC Designer to structure the data that I have collected for implementation of the BSC process. The program helps me in sharpening my measurement tools. From the first user experience, the interface looks rather intuitive and is able to allow the user to know his/her way around easily. Also, it does not require complicated installation, unlike some BSC software in the market. Ivan, I thank you for your feedback! I do agree that a simple installation is one of the biggest benefits of BSC Designer. When we were designing the first version, we asked ourselves a question: what is the biggest problem with corporate software? Why are independent performance experts still using Excel for the Balanced Scorecard? The obvious answer was that we need to suggest a simple installation and a clear user interface. According to your feedback and to what other users are saying, we have achieved this goal. Also, we didn’t want BSC project to be closed, we were looking for a simple way to manage it. When one has a MS Word document it is easy to send it to a colleague. No one asks you to install a database to do this simple action. That’s what we wanted from BSC software. The solution was to use an open BSC file format where a Balanced Scorecard project is a file that you can be sent to your colleague as you would do with MS Word document or MS Excel spreadsheet. As for structuring data, in the latest version of BSC Designer you will find that functions on the “Business goals” tab have been significantly improved. For example now, you can not only specify business objectives and set a cause-and-effect link between them. For example, objective B from “Customers” might contribute to objective “A” from “Finance.” What is more exiting is that BSC Designer can automatically present all of these links on the strategy map. Learn more about updated strategy map design process. We are using BSC Designer for linking strategy and corporate goals to KPIs and for measuring the performance of divisions and the company as a whole. So far I’m still trying the product. It looks promising, but I need further information and training to be able to implement it in the company. I’ve seen other products, but this one looks easier and it is more straight forward. I like the idea that it uses Excel, as we all have plenty of experience using it instead of using a new product that requires training and attached to a company that might increase the cost dramatically. It’s really good that you find the product easier to use than similar strategic planning and performance management products. We invest a lot of time in making the product more logical and easier to get started. Other users also reported BSC Designer as easy to use, feature-rich, good-priced, flexible for BSC. And it is not only about the program itself, our goal is to improve the whole use experience. We know that most corporate software tools are really difficult to install and maintain. With BSC Designer we don’t require any databases to be installed and it also helps users to enjoy our product. Right now you are in the process of trying a product. I hope you will find it useful for your tasks. As for more detailed information, here are some video training for various features of the product. If you have some specific question, don’t hesitate to contact us. Finally, I’d like to share few thought about Excel. I was working with users that love it and hate it at the same time. It is an excellent business tool, but talking about business scorecards it can effectively support only prototype stage, when company start thinking about proper KPIs. The Balanced Scorecard is not only about KPIs. If top managers want to use BSC to execute a strategy effectively then need to have a strategy map and cascade the main scorecard to department levels. We are talking about this in implementation plan section. Unfortunately, Excel cannot be used on this level. But, you can still keep some important data in your spreadsheets and BSC Designer will make access to this data easy. It has been useful for controlling the goals of the people. Show to the stakeholders the results. The product is excellent and integrates diverse areas of the company to the same objective. We can control the KPI of the company and see the status of the projects. The product helps us to have a clearer view on how our goals are achieved and accompanies them during the project period. It helps to align the team to know the current status of the projects, if they are late, on time or already achieved. We can send the file to anyone who can update the information and let everyone stay abreast of any developments. The program is easy to use because it uses a rational and simple logic. Just follow the sequence so that the person filling out the fields with the information can do so. This is important because it enables access to people who do not have much knowledge of computers. Thank you for your detailed feedback. We believe that a simple installation of the Balanced Scorecard software is one of the success factors of our tool. One doesn’t need to call a system administrator because of expensive database installations are not needed. Our product is distributed as a single installation file and the program is installed on a manager’s PC in a minute, not days. Additionally, there is a BSC Designer Online that works as a web-based service. There you don’t need to install or maintain anything, just sign up and start using the software online. Anytime you can download a .BSC file that is compatible with a desktop version. The “clearer view” effect that you mentioned is actually what many other users reported. As you can see the software is not a magic pill, it won’t replace employees or important business process, but it will add logic and provide a top level view to a project or the whole company. That’s what others call a shift from “doing a job” to “helping a company to achieve its goals.” When any initiative of an employee is aligned with a specific business objective, there is a KPI that tells a manager if an employee is on the right track. With this approach there are many more chances to execute a complex strategy properly. Your initial feedback was about older version of BSC Designer. In the latest version the program will help even more in formulating business objectives, aligning them with KPIs and action plans and representing information on the strategy map. As for data entry, both desktop and web-based editions support various data importing functions. One of the most popular is an access to the data saved in MS Excel spreadsheet. For sure, it is still possible to access an external database or enter data manually. Hope to implement BSC designs in a diverse set of business domains using this software. Evolving methods of Systems thinking in an organization can be a rather vague task-it can be rendered more concrete by using the BSC quartet of Objectives, Measures, Targets and Initiatives in all of the perspectives. This involves reorganizing the strategy maps from a systems point of view. Objective mechanisms can be established using the BSC quartet to achieve Team learning and knowledge management using emerging techniques in collaborative and cooperative learning. In conclusion Kapalan & Norton’s BSC and Peter Senge’s Learning Organization are mutually complementary concepts and it is high time their synergies were used in an integrated manner by organizations- especially those, who seek to be one up on their competition using the tool of BSC. BSC Designer is the perfect tool for KPI reporting and controlling according to the Balanced Scorecard method. Compared to the alternatives it offers a simple control, a user friendly interface, and graphically good looking reports that may be exported into Excel or HTML, furthermore it’s possible in this program to organize own KPI in their own categories and structure, including weight assignment very simply. Martin, thank you for your feedback. Yes, we invest in creating simple interfaces that would not require any special training. We have followed the same approach with installation. Any business professional can download and start using BSC Designer right way with no complicated installation or database configuration needed. Our idea was to make the management of the Balanced Scorecard projects as simple as working with MS Word documents. The same approach was used when we created Online and Android editions, as all they use the same document format. You mentioned that you use a combination of KPIs and an HTML report. According to requirements of our users in the most recent versions you can find even more functions for KPI management. For example, now you can use formulas for the values of KPIs. 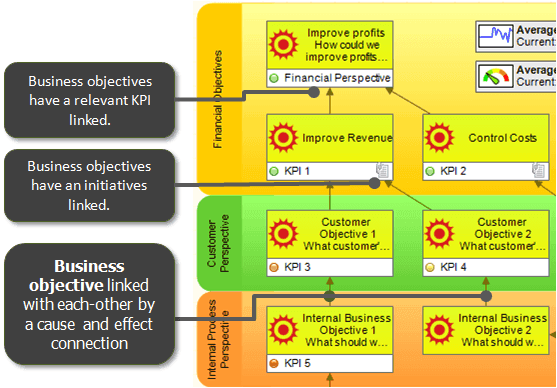 As we are explaining in articles on BSCDesigner.com, KPIs are just a measurement tool. The next logical step is to act according to the specific value of a KPI. For example, as a quality manager you might use KPIs to find that something is going wrong in your business process. What do you do then? Correct! You assign an action plan. 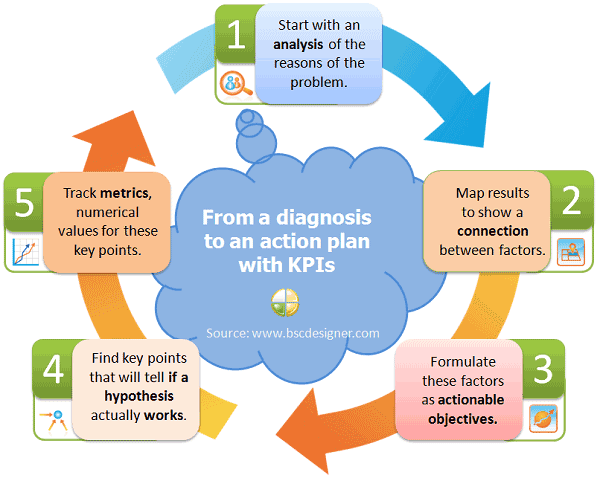 In BSC Designer you can link this action plan to your KPI using initiatives. As for an HTML report, there is one feature that I find really useful. You can publish an HTML report automatically to a company’s FTP server. If you prepare regular reports for your boss, then BSC Designer can take care of preparing this report and uploading it to the company’s server. As a result the only thing that you will need to do in order to share this report is to send the link to all involved employees. The main tasks that I’m solving with the help of BSC Designer are controlling productivity and KPI of our sales managers controlling productivity of SMM managers. I’m really thankful for such a good decision to control the efficiency of our company’s sales managers. This KPI control software helps me to see the picture of people’s productivity in a very simple way. What I like most of all, is that I can see the productivity in different ways: graphics, numbers, percentage and so on. Also I can export data to Excel files, so our stuff can get the data and understand how efficient they are and in what fields exactly they need to work more. This gave us an objective view. Thank you for such an interesting feedback. I hope that from the lessons that you are getting by email after downloading BSC Designer you have learnt some new, useful techniques about the Balanced Scorecard concept and managing KPIs. For those who will find this opinion text in search engines, I’d like to mention that the Balanced Scorecard approach is not about KPIs only. KPIs tell us a story about what’s happening with productivity right now. This is performance monitoring. The Balanced Scorecard can give us an idea about why it is happening and what we can do about this. In simple words this is performance management. Here is how both performance monitoring and management is automated in BSC Designer. The difference is small, but this small difference is what a company can employ as a formalized approach to search and analysis business insights. This small difference can help anyone to focus company’s activities on what’ matter. 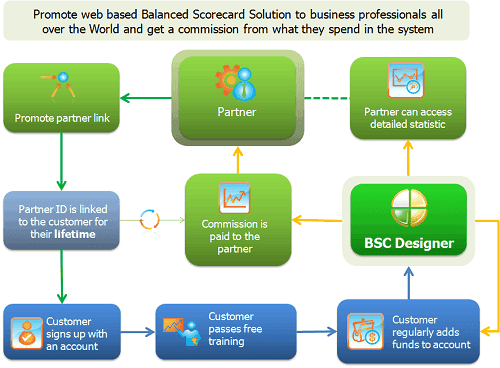 We use BSC Designer for creation of the Balanced Scorecard for the bank. I proposed Balanced Scorecard for an implementation using this software to demonstrate its usefulness. I think the product is good, I particularly appreciate the support that is available during the design process of the scorecard. The software is also quite user-friendly, making it possible to easily follow through the required steps in the design process. The tabs are separated according to various tasks of the BSC like the strategy map, KPI’s, etc so one does not get completely lost and is able to make sense of where he is. Thank you for sharing your plan. BSC Designer was recognize by other users from Brazil, South Africa, Turkey as easy to use software. We are really glad to hear this as we believe that it is important to keep software simple. As you have mentioned, it is able to solve various tasks related to the Balanced Scorecard: Strategy Maps, Business Goals, KPIs, and cascading. All these parts can be used together, or one can focus on the most important part. We know that some people prefer to start with KPIs. We wouldn’t recommend this approach as KPIs make sense only if placed in a business context. That’s why the better idea would be starting with defining of the business strategy. There is a good article on the topic: A journey from a bad KPI to an excellent strategy. The last one is a case study with Caja Rural – financial institution in Spain. Check out this case study for more ideas about BSC implementation. You can also use it as a case to convince other stake holders. We took the challenge of using BSC Designer at our Balanced Scorecard implementation project in Lithuania. As a tool relatively easy to operate and convenient for practical realization, it helped our customers to develop efficient scorecards and as a result improve their business performance. BSC Designer helped us to realize BSC implementation project for a multi-site NGO in Lithuania. BSC Designer gave us a solution reporting critical business indicators on a local site level. BSC Designer is directly addressing the business needs and management challenges our customer is facing. By integrating BSC Designer and ISO based management systems IRS Consulting will be able to link business performance indicators to processes. The main goal of our client is to reduce costs and commit local employees to come up with suggestions for improvement. At our BSC implementation project small internal group developed a strategy map based on the data needed in order to make comparable reports and discuss managerial questions. For each success criteria some performance indicators were defined and the setup was launched. It became clear to us that the management information system needed to be much more flexible than a data warehouse and that is one of the reasons why we chose BSC Designer. BSC Designer is a very flexible system which allows the top management to follow up on all the defined indicators continuously. It has web-based service and therefore easy to implement and deploy. In addition the balanced scorecard system makes it possible for the management to see all performances of the departments at a glance. This BSC implementation process with BSC Designer had a very positive influence on the implementation gaining commitment from everyone and adding transparency to it. In order to make BSC project as successful to the regional managers as it is at a corporate level, our customer is currently considering also developing more strategic scorecards for central and local business development purposes, ensuring the alignment of all initiatives with the strategy of the organization. Andrejus Kaleinikovas, Managing Partner of IRS Consulting. We use BSC Designer to manage strategic and operational KPIs. These indicators are updated weekly, monthly and yearly. We plan to use the software for the evaluation of single values as well. We are evaluating BSC Designer and if it fits our needs we are going to implement it into our business processes. The first goal is to transfer the balanced scorecard that we have now in an Excel file to the BSC software. The complicated part may be to create single indicators that will incorporate the aggregated values of other KPIs. For example, in Excel I can consolidate values from different lines by summarizing them and I have to see how to do this with BSC Designer. Thank you for sharing a detailed implementation plan for BSC Designer and the Balanced Scorecard. I believe BSC Designer will provide all of the necessary features to support your decision. As for MS Excel, I know that a lot of companies use it for a prototype and basic BSC, but then people prefer to move up to a professional BSC Software. Some users reported that BSC Designer helped them to avoid home-made Excel spreadsheets, others say that scorecards in Excel were difficult to maintain or it was too complicated to update Excel spreadsheet with a new information. You can get your data from Excel. You can decide whether to import all the data or link a certain KPI to a specific value in Excel. As for working with aggregated values, you can follow the same idea as in Excel. You can specify a formula for a KPI where you can, for example, summarize the values of other KPIs. Also, you mentioned that KPIs in your scorecard will have a different update interval. In BSC Designer you can specify an update interval for each KPI and the program will inform you about an upcoming upgrade deadline. That is a simple notification. 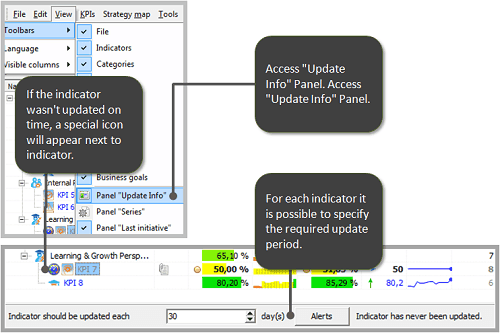 You can also create special alerts that will inform you about important changes in the KPIs via email. We used BSC Designer to build an overall index to measure the Supply Chain department performance. There must be an option to use the weight factor. I was searching for a tool, which would help me to build an overall index for Supply Chain department performance. BSC Designer seems to be the right tool – easy to use and also to share with others. So far, I was trying to prepare something similar in MS Excel, however it was too complicated to update with new data. I will see if your BSC Designer will satisfy all of my needs. Jiri, I thank you for your feedback and opinion about BSC Designer. MS Excel is a popular business tool and there a lot of business professionals who keep their data in Excel Spreadsheets, as for the Balanced Scorecard, it is not really suitable for that task. One can manage to build their formulas and link them, but when it comes to multilevel KPIs or scorecards then the process is a nightmare. With BSC Designer sharing vital BSC information is easy. You can generate an HTML report and share it with your colleague. Or you can sign up with BSC Designer Online and share the whole project with anyone from your team that has a PC or a tablet with an access to the Internet. You mentioned that one of your goals is to build an overall index to measure the performance. Although this approach is very popular in the business world, it has its own problems, and doesn’t give a big picture. For sure, you can use BSC Designer for building an overall index, but I would suggest adding a strategy map with some key indicators on it something similar to what was explained in this article. BSC Designer product gives us the possibility to determine the impact of intervention factors on the financial results. Your product, the BSC Designer is very easy to use and creates possibilities to determine the reciprocal influence of several factors on the total result of an organization. For us as consultants, BSC Designer is a very important tool to give insights in complex business situations. We can measure the impact of our interventions on the end results. Thank you for your feedback. How did you determine the impact of intervention factors? I think that you used a weight value that each indicator and category have in BSC Designer. In this way one can specify the relevant important of each indicator. BSC Designer calculated the relevant importance taking into account the weight of an indicator, as well the weight of its category. This whitepaper explains in detail how the weight is used in calculations and what formulas are used to calculate a final performance. A strategy map in BSC Designer has several placement styles. Besides a classical Balanced Scorecard there is a placement style that allows presenting a hierarchy of KPIs in a form of the tree. This type of map is also useful to present indicators and show how they influence on each other. We use the software to control major indicators that will allows us to solve the development of a very specific software as efficiently as possible. First we identified the major indicators associated with our activity. A risk analysis was conducted for each aspect very carefully. Then we have selected the more critical and relevant ones in order to fill our foreseen Balanced Scorecard. At this stage, I decided to try BSC Designer Light software. I found it quite easy to use. First I entered the indicators data selected before. Software provided various ways to manage and display ongoing activities. Certainly, will I continue to use BSC Designer. Glad to hear you discovered BSC Designer Light on time. 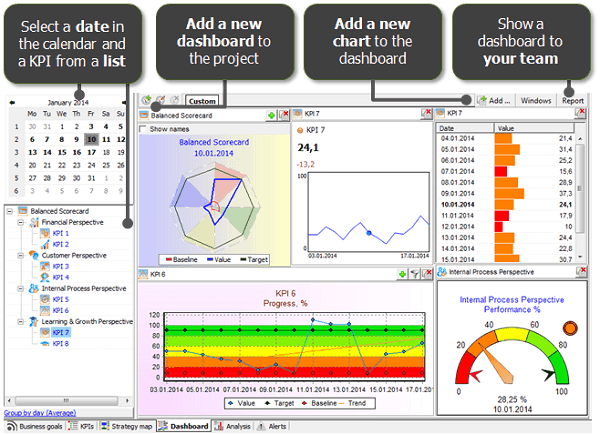 This is a freeware edition of BSC Designer that provides basic functionality to manage KPIs. There are much more functions in Standard and PRO edition. Check out this table to see the difference. In your case PRO edition could help a lot. I think that you had to manage the results of risk analysis in some way. The best idea is to map out the risk factors on the strategy map and how the relationship between each risk factor and risk control measure compares with others. The good thing is that once you have the results of a risk analysis on a strategy map and you have KRIs on KPIs tab, then you can align these KPIs with risk factors from the map. As you can see on the picture above, once KRI are aligned with risk factors, BSC Designer displays this next to the object on the strategy map. Finally, one can add a risk management plan using the “Initiatives” function in BSC Designer. These initiatives can be communicated to others using reports function and can be visualized on a dashboard. In this way BSC Designer software can work as a single center to map the results of your research, manage your KRIs and generate reports to stakeholders. We are using BSC Designer for the business risk hazard management relating to to all occupational health, safety and environmental. Having used the program, I was pleasantly surprised as to how versatile the product was and how relevant to the intended context it was trialed for. My associates have been looking for a product to suit the manufacturing component of the business and may consider looking at the program in more depth in the near future. There were a lot of discussions about risk management and the Balanced Scorecard. It seems that both business frameworks are talking about the same problem, but are trying to solve it from different points of view. The Balanced Scorecard concept focuses on the strategy planning and execution, which is obviously not possible without researching and managing risks. In its turn professionals from risk management communities insist that risk management is a separate discipline and should be treated accordingly. As far as we know from the discussions on LinkedIn some authors are preparing to publish books about Risk Management and the Balanced Scorecard in 2014. I think it will be interesting to explore their ideas. Probably we will see a new hybrid concept soon. As a developers of BSC Designer, a business performance management software, we were following requirements from our users and tried make it easier map and manage risks in the Balanced Scorecard. In BSC Designer one will find a special “risk” measure units for a KPI item. One can change the measure units to risk for any KPI. BSC Designer will treat this KPI as a KRI (Key Risk Indicator). 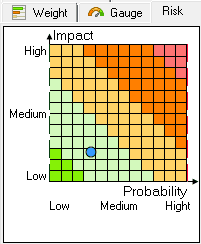 Risk manager will be able to enter risk probability and impact. BSC Designer will also show a risk diagram that is a standard risk visualization mean.